Many of the benches in New York’s Central Park bear small metal plaques. Most are dedications to departed loved ones for whom the park was a special place. They are places to sit and remember those who have left us and recall the times spent there in their company. They are places of thoughtfulness and reminiscence. Not your usual sentimental park-bench dedication. If you feel like taking the plaque writers up on their advice, you’ll find this bench on the path leading to the entrance of the Central Park Zoo. The lack of gravitas evident in this particular bench plaque put me in mind of a place I know from my travels, Romania’s famous Merry Cemetery, where the colorful grave markers bear epitaphs that are generally humorous. Some incorporate witty poems that poke not unkindly fun at those they commemorate, while others are a little less forgiving. The inhabitants of the little town of Săpânța take it all in good faith. This New York Times article, You’ll Die Laughing, if You’re Not Already Dead, tells its story quite nicely. That’s all for today! Thanks for bringing your tush over to my blog and see you again soon! 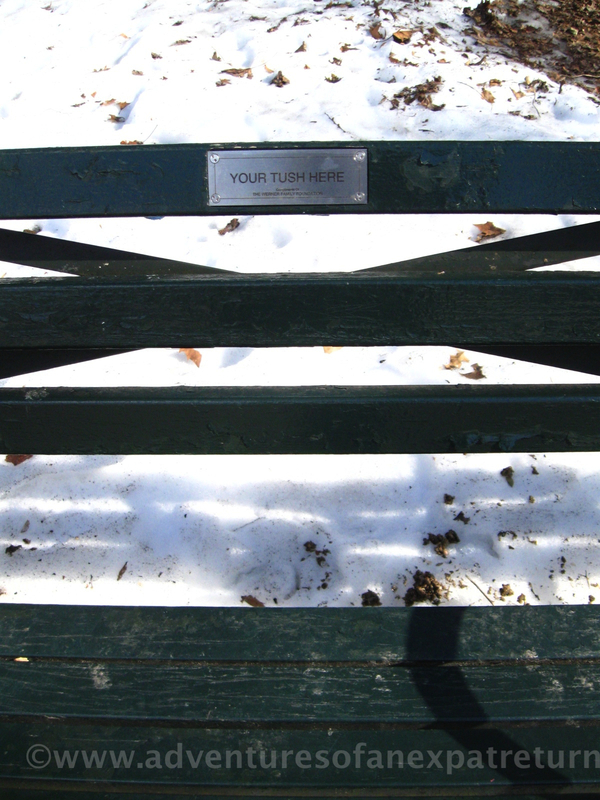 This entry was posted in In Jest and tagged bench, Central Park, Commemorative plaque, New York City. Bookmark the permalink. Amusing – merci, too, for visiting & following my blog. I’m glad you enjoyed it! As a former expat, I enjoy seeing what you’re up to on the French Riviera. I’ll be back to visit. Until then, best wishes! Such a fun post Jen, love your writing! Thank you, dear Tuula! Happy Monday to you, too. And give Provence my love!